My favorite way to travel in Paris is the metro, but when I was in Paris for LeWeb last month, I ended up getting a ride in two taxis, one a traditional Paris taxi, the other, an Uber. In light of the controversy surrounding France’s new 15-minute law, and the violence that has erupted in some circumstances, I thought that it would be useful to explain some of the differences I noticed during my two rides, and what I think it means for France, entrepreneurship and innovation. I took my first taxi of the week at 11 o’clock at night off the Champs-Élysées, after wandering for a bit around the amazing Christmas markets that call Paris home towards the end of the year. It was cold and I was happy to find a row of three black Paris cabs waiting to pick up a fare. I got it in, said bonsoir and buckled up. I speak French but the driver immediately picked up on my american accent and started speaking to me in perfect english. So perfect that I assumed he was British and asked him where he was from to confirm. He said France and keep driving in silence. After a few minutes, he asked me if I knew the To Be or Not to Be soliloquy from Hamlet. He had memorized it last night and before I could respond, he was reciting it with perfect intonation and cadence. It was a very moving experience to hear Shakespeare spoken so beautifully driving through Paris in December, a city already known for its lights at any time of year, but particularly breathtaking at Christmas. He eventually got to a stanza that he couldn’t remember and stopped. I thanked him for the beautiful recitation thinking to myself that I would definitely be giving him a large tip. I was happy to pay my share for such a unique experience that he had just provided. A few days into my Paris stay, it already one of the highlights of my trip. “I’m SO bored”. Those were his next words. “I’m SO bored with LIFE”, he said, really drawing out the words “so” and “life” for effect. “This job is just to pay the bills. But even when I’m home, I’m board. I memorized To Be or Not to Be last night. Tonight, I will memorize another probably.” Silence. We soon arrived at Parc Montesouris, near where I was staying in the 14th arrondissement. I reached for my wallet and pulled out my credit card to pay the fare, and a big tip for the beautiful poetry. “You don’t have cash?” I looked in my wallet but just had 10 euros, not enough to cover the tip I wanted to give, let alone the fare. 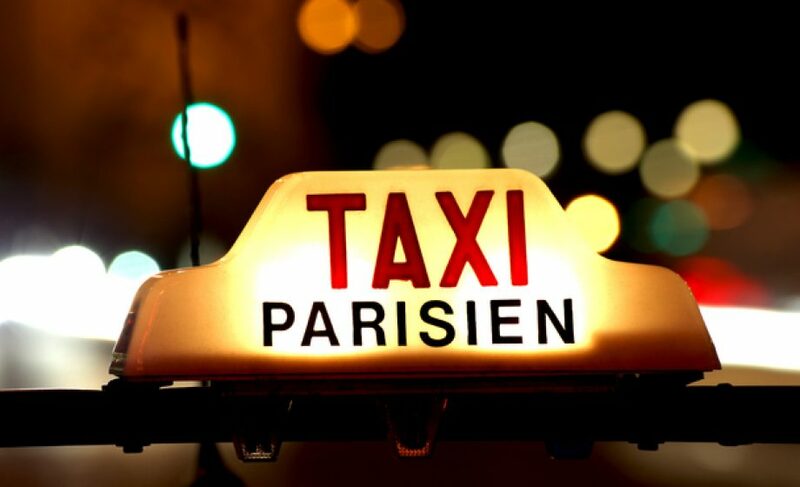 “When you get in a Paris taxi, you have ask if they take plastic. Now we have to go find an ATM. Where is the closest ATM?” Being in a new part of Paris for the first time, I didn’t know. He played with his Garmin GPS for a minute, trying unsuccessfully to find a bank. Then he pulled away from the curb, audibly exasperated, looking for an ATM. “Is it this way? Which way do I go?” I didn’t have any idea, but he keep asking me to find the ATM. We eventually did find one. I got cash, paid the fare and a tip, though at little less than I had originally intended. The next day, I was running late for a meeting in the city after listening to Arnaud Montebourg speak about France’s perspective on managing the societal change that innovation brings and needed to catch a cab to save time. Since there weren’t any taxis nearby, I called an Uber and was sitting in a shiny BMW heading south in about 2 minutes. The driver asked me how my day was going. After answering in French, he noticed my American accent (again!!) and offered to speak in English if I preferred. He was dying to visit the U.S. Not a big city, but somewhere close to nature so he could relax. We chatted for a while and I asked what he thought about Uber. “Uber is my partner. I work for myself, but for now I like partnering with Uber. They do a good job. I don’t know if I’ll always partner with them, but for now it’s good.” I mentioned that the reason I was in town was for a tech conference and I had seen the CEO of Uber speak about building Uber and their plans for the future. “You know, I have an idea. I don’t know if it will work, but I have an idea. For now, I’m partnering with Uber, but I’d like to have my own fleet of cars. If I can create an app, I can have my own drivers and manage the process. Do you know how to create an app?” I told him that there are companies you can pay to build an app for you, and sometimes it doesn’t cost a whole lot to do something small. He could also find a developer who wanted to build something similar and they could do something together. The rest of the trip we talked building apps, French tax law, the proposed 15-minute rule, raising a family. When I arrived at my meeting, he got out of the car, shook my hand and said “You know what. I’m going to do it. I’m going to make an app and start a business. We’ll see what happens.” I gave him 5 stars. Two taxis. Two very different experiences. Despite enjoying one of the most beautiful dramatic recitations I’ve heard, I left taxi #1 feeling depressed. Depressed that someone so talented could be underutilized by society and so seemingly unaware of the million ways he could use his enormous talents to create a joyful life for himself and others. I left taxi #2 feeling inspired. Inspired that this taxi driver saw Uber not as his employer, but as his partner and more over as his future competitor as he planned to take advantage of the same trends that made Uber itself possible. It turns out that for France, as for Hamlet, to be or not to be is also the question. It’s not an easy question either. Innovation fuels growth and leads to better quality of life. But it challenges, disrupts and destroys existing systems. That’s the essence of innovation and the French understand this very well. Creating something new out of the ashes of the old is the story of the French Revolution, which unlike its American precedent 13 years earlier, succeeded in upending society in its very stronghold of tradition and privilege, not simply in a colony 4000 miles away. Despite what minsters like Montebourg hope to be true, it’s impossible to expect that entrepreneurs can only innovate in complete greenfield areas where no existing producers will ever be challenged. What surprises me, though, is that France hasn’t figured out how to use its generous social system as a way to really excel at innovation. In the U.S., losing a job (this includes quiting a job to start a company) means losing health insurance, losing retirement benefits, losing tax breaks. If France wants to truly lead the world in innovation as President after President, Minister after Minister says, then it needs to allow disruption to occur, letting its social system lesson the pain as some business fail, and others spring up. The French revolution was successful at changing society at great cost. I believe the same is possible today with much less blood, thanks to the French safety net which can encourage individual risk taking necessary to succeed during a technology revolution. To be clear, the real victim of the 15-minute law isn’t Uber. The world is a big place and Uber will be fine. And it’s not consumers who will have to wait longer for a taxi. Paris is a nice place to wait. The real victim is the millions of would-be French entrepreneurs who will not be pulled up into a system that shows them the possibilities that open up when you build something that people want. Taxi #1 didn’t see this world before him. Taxi #2 did, simply because Uber existed. Montebourg’s most ardent defense of the French system at LeWeb, the speech I listened to right before calling an Uber, was that in France, the producer is as protected as the consumer. The fundamental mistake he makes, however, is that in defending one producer, another, my Uber driver, is left out to dry. To be an innovative country that thrives in the next century or not. That is question. I hope that France chooses well.